This week WILD ABOUT HARRY is showcasing rarities from the private Libbet Crandon de Malamud Collection, courtesy of Anna Thurlow, the great granddaughter of "Margery" the Medium. While know Margery and Dr. Crandon enlisted J. Malcolm Bird and Heward Carrighton as informants during their seances with Houdini in 1924. But is it possible that they also had an "inside man" at the infamous 1929 Arthur Ford seance in which Houdini's spirit was said to have returned and delivered the coded message to Bess? Apparently they did indeed. The evidence comes from a remarkable find in The Margery Files. 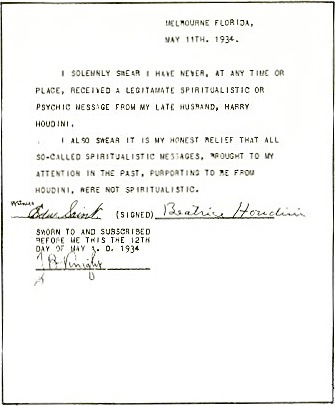 This is an original photostat of the letter Beatrice Houdini signed after the seance affirming that Ford had delivered the correct coded message. This letter was sent to press outlets and has appeared in print before. 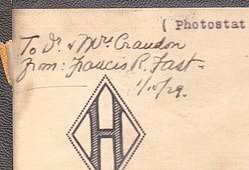 But what makes this copy especially interesting is that it was sent the day after the seance to "Dr. & Mrs. Crandon" by Francis R. Fast, who was part of the inner circle. This is the first evidence I've ever seen that shows Margery was looped into the Ford seances by someone on the inside. So who was Francis R. Fast? Fast was a wealthy patron and close friend of Arthur Ford. He and Ford actually shared an apartment. It was Fast, along with John W. Stafford, Associate Editor of the Scientific American, who travelled to Bessie's home on January 6, 1929, to tell the widow (recovering from her famous fall) that Ford had contacted Houdini via his spirit guide "Fletcher." After this, Bess agreed to sit with Ford. Even though he was a stranger to Bess, Fast was at each of the Ford sittings. Fast also appears to have been an acquaintance of Sir Arthur Conan Doyle. 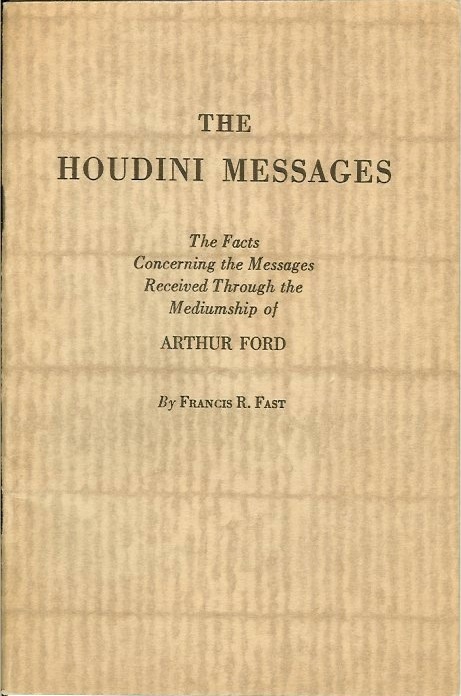 After Ford claimed to have made contact with Houdini's mother during a Feb 8, 1928 seance, Fast sent a coded message to Conan Doyle informing him of the event. Doyle passed the information onto Margery, referring to Fast and Ford as "our people." Enough has happened in these latter years in the way of outstanding demonstrations of psychic phenomena to give anyone ample reason to alter any preconceived notions about these things, what with the clear-cut and as yet unassailable results in the "Margery" case alone, on which the whole argument for the survival and communication may rest secure for all of time. The letter Bess signed on that fateful day in 1929 was used against her (and Houdini by extension) by pro-spiritualist forces for years. Of course, Bessie isn't really saying that Houdini delivered the code from beyond. She's just saying that the correct code was delivered by Ford. How he got the code is another story. In 1934 Bess would issue a new statement firmly renouncing the Houdini messages. Francis Fast background from The Houdini Code Mystery by William V. Rauscher and The Secret Life of Houdini by William Kalush and Larry Sloman. 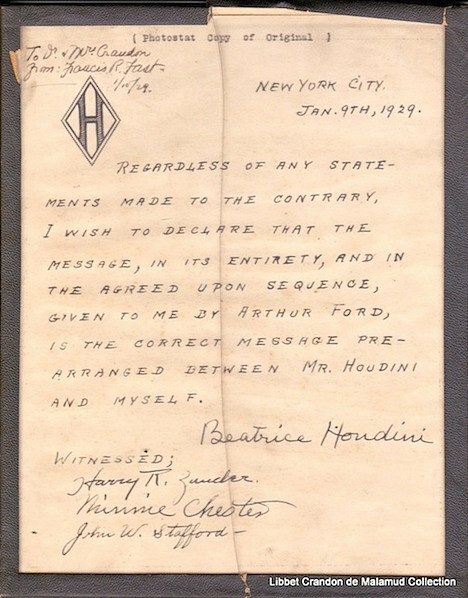 Bess retraction letter from Houdini His Legend and His Magic by Doug Henning and Charles Reynods. You've probably covered this elsewhere - I know that is Beatrice's signature but is that Ford's printing and wording on the document or someone else's? Amazing work - I'm hanging out for each instalment. I haven't covered that, and I never really thought about it until I did this post, but I'm sure that was written for Bess by Ford or one of his crew. She just signed it. Great series! Well done! Did you learn more about where she stashed the ectoplasm? LOL I was wondering when someone would ask that question. I have purchased and read more about Ford and Harry this last year than any subject ever before. I was amazed to learn about photostats in the 1920's.. Who made the photostats? Did Arthur Ford make them and send them out or did Mrs. Houdini have it done ... Or someone else or both? you seem to think that Ford wrote out the confession ... Did you ever think that Saint wrote out the denial? That's a good point. Saint very well may have written her final statement. I'd even say it's likely. You know, I've always been confused about Rea Jareau and the Graphic's involvement in all this.